I've finally fixed my only vintage phone, an old Western Electric 302, and thought I'd share the old telephones' electro-mechanical guts. Stick a finger in the number you want to dial next, rotate the dial clockwise until your finger hits the silver finger stopper thingy. Then, remove the finger, and the dial rotates at a precise speed, sending up to 10 pulses within one second by way of contacts and cams. The pulses are timed to within 10% of 66ms with the magic of physics. 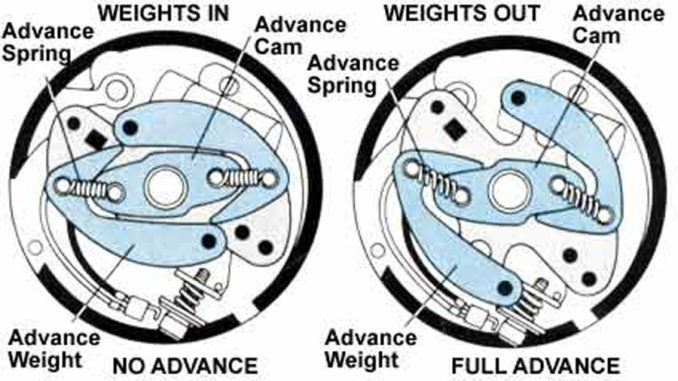 The dial uses a speed governor with hinged weights attached to a spinning shaft, similar to automotive distributors' mechanical advance mechanisms that are used to advance timing as engine rpm increases. 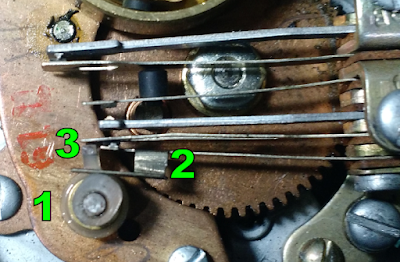 In the 302, the spinning shaft is driven by the dial return spring. As rotational speed increases, the law of inertia for the mass of the weights (1) and the centripetal force at the hinge point cause the weights to rotate outward, overcoming an adjustment spring (3). Rubber stoppers (2) mounted on the outside of the weights then contact a containing drum (4), where friction prevents further speed increase. The electrical pulses are made by a cam that makes and breaks a set of contacts. 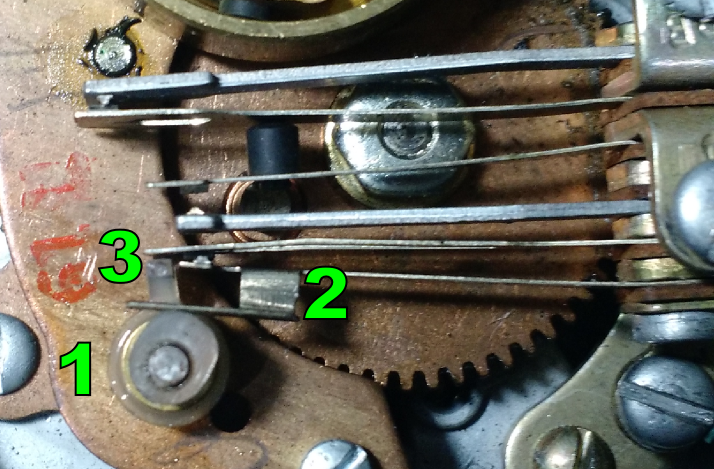 The cam (1), driven by the dial's geartrain and return spring, raises and lowers the flexible contact arm (2) to make contact with the second flexible contact (3). When one initially rotates the dial clockwise, no pulses are sent. The cam (1) rotates counterclockwise along with a raised nub (3). When the nub is out of the way, the top contact is allowed to move down, remaining in constant contact with the lower contact (2). 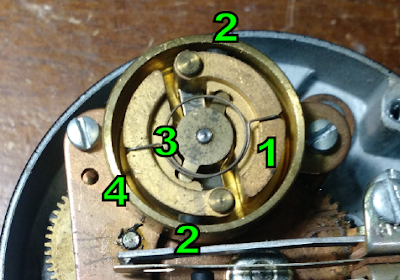 When the dial is released, the cam immediately rotates clockwise, raising the contacts (2,3), while the nub rotates into place, holding the top contact up, so that the cam can now break the connection once per rotation. Adjustment of the governor spring ensures the frequency of the pulses falls within the tolerances specified ages ago by the phone company. 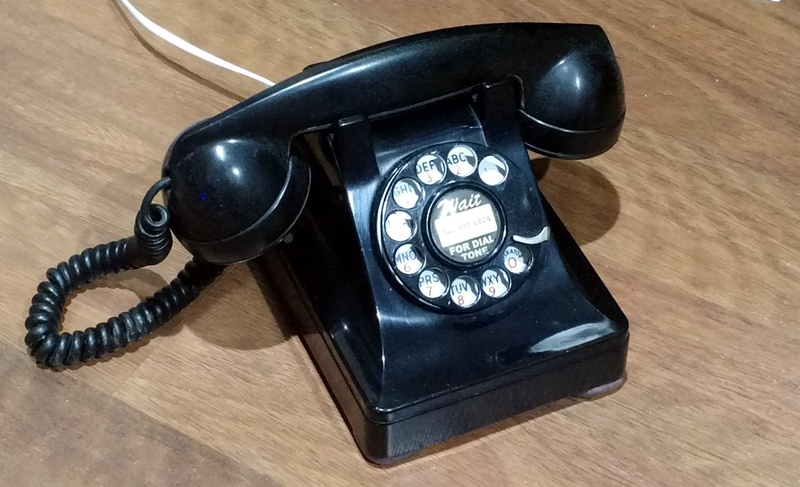 By the way, many modern phone companies have equipment that still support pulse dialing. Including those at my central office. I don't know what test equipment the Bell companies or Western Electric used to calibrate these dials. 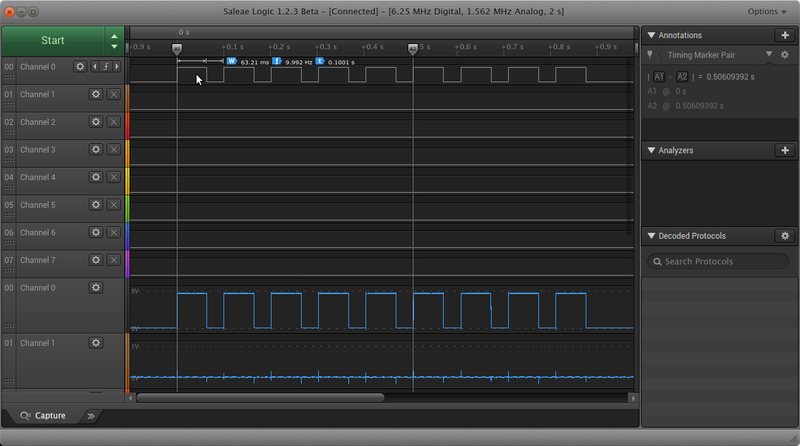 But I used a thoroughly modern (and indispensable) Saleae Logic 8 Analyzer. I connected one contact to ground, the other to 5V through a pullup resistor, and measured that contact. When the connection is made, the voltage drops to 0V. When it is broken it rises to 5V. Following lubrication and cleaning of the horribly gummed up dial mechanism, it was spinning a bit too fast, with 10 pulses being sent in only 0.9s. 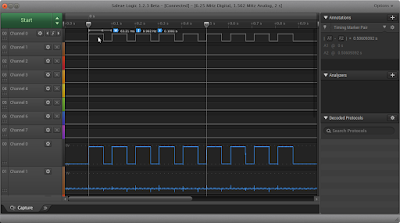 Tediously tweaking the governor spring, I got within 1% of the target (506ms for 5 pulses as shown below). Adjusting the duty cycle (pulse length) is a matter of bending the contacts slightly. With a little tweaking, and verifying that pulses are only sent when the dial is returning home, the dial's pulses are now within a few ms of the 66ms target across the entire rotation and range of numbers. And, more to the point, the phone company correctly recognizes the numbers I dial. Of course, none of this was possible until I first fixed the phone's internal wiring. More on that in a future post.